It is very hard to find good pictures of female dress from the 1000’s but I found a few. It isn’t quite enough for me to dare to say something of trends yet. Lady in a window. She is wearing a blue gown with gold details. Her sleeves are wide and looks to be on a over-gown. 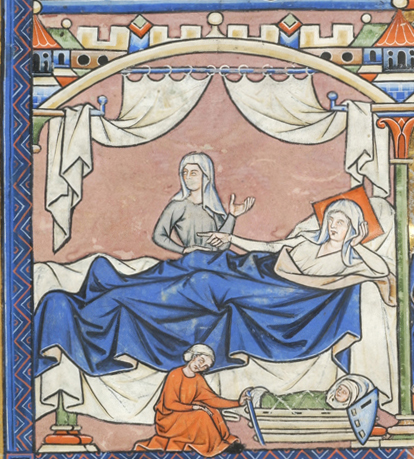 In the 1100’s women started wearing cotes/tunics/gowns/kirtles with a close fit to the body. Eve spinning in a long gown/kirtle with straight sleeves and a linen veil, c. 1170. Full skirts, and long flaring sleeves were characteristic of upper class fashion for both men and women. Under the outer dress they would wear a cote with tight sleeves, sometimes it would seem very long ones as they wrinkle around the wrist. In the first half of the 1100’s the sleeves were flared but not huge, while they could get quite large towards the latter part of the century. Decorations on the sleeves and around the neckline seem to be common among noble woman. Women are not depicted wearing belts in this period. Woman wearing a full length tunic with a wide colored area around the neck. It seem to be loose. And she seems to be wearing a tighter very long sleeved (see the rikles) shift underneath. Man and woman. Both are wearing long loose tunics, that doesn’t have a waistline. He is wearing a mantle and she is wearing a veil or open hood. Sitting woman wearing a cote and overdress as well as a chape. Woman playing a instrument while wearing a cote and overdress as well as a chape. Women riding sidesaddle wearing a chape and a bliaut on a camel. Women of the French court wore a loosely fitted tunic called a cotte or a form-fitting bliaut over a full chemise/shift with tight sleeves. The bliaut had a flaring skirt and sleeves tight to the elbow and then widening to wrist in a trumpet shape. A bliaut apparently cut in one piece from neckline to hem. The fitted bliaut was sometimes worn with a long belt/cincture that looped around a slightly raised waist and was knotted over the abdomen; the cincture could have decorative tassels or metal tags at the ends. Dress for women was modest and restrained, and a narrow belt was the uniform. Over the cote was worn a cyclas. More wealthy women wore more embroidery and their mantle, held in place by a cord across the chest, might be lined with fur. Women, like men, wore hose and leather shoes. Many of the pictures of woman in the 1200’s just have them wearing their cote and perhaps a mantle rather than the later period’s elaborerte surecotes. The cote is sometimes richly decorated. The cote of the 1200’s has fitted sleeves and a fairly loose body. It is sometimes belted, sometimes not. It would seem that some cotes had open armpits so the sleeve could be pulled back and out of the way. Woman in a blue cote (olding a servered head?) and the queen is in a white/grey cote and red mantle. She wears a veil under he crown. Women in a blue cotes and the queen is in a white/grey cote and red mantle. She wears a veil under he crown. Belted cote under a drapped mantle (roman style), c. 1284 The drapped mantle might be to indicate that this woman is “eastern”. For a long time noble women would wear surcotes with large armholes showing off the tunic underneath that would be of a different fabric. In the 1200’s woman would wear cyclas almost like the one the men would wear. A Cyclas began as a rectangular piece of cloth with a hole in it for the head. Over time the sides were sewn together to make a long, sleeveless tunic. Working woman wearing a cyclas and using it to carry grains. Over the cote many noble woman would wear some kind of surcote. Not all of the examples form the 1200’s are cyclases. The gardecorp came into fashion in the 1200’s. The garment is wide in the body and has long sleeves. The sleeve are cute open near the armpits so that the arm can pass though when the warm of the sleeves are not needed. The length wary from knee to full length. They often have a hood that is worn up or down. The fashion lasted until some time in the 1300’s. Though variants turn up later. They evolve into the split-sleeve houppelandes of the 1400’s2revivalclothing.com It is also possible that some of these are sleeves of cotes being open and pulled back. Both men and women in the 1200’s seems to have worn very simple mantles. Like with the men it is mostly noble women wearing the mantles. This is an image based research post on what woman wore between 1000 and 1300. My main interest is Northern Europe but because scarcity of images from part of the period, pictures from all of the medieval world is used. I try to be exact as possible with dating and naming the sources. In a few case that I find no source, that is also mentioned in the description of the image. I know many other people have done similar things and I link to some of them and I am grateful for everyone who takes the time to not just study but also write about the medieval period. You can find a post on the female fashion for head wear and hair styles in the period here. And I have large post on what the common people wore in the middle ages here. If you are interested in medieval underwear you can find that here.